This building of colonial appearance and elegance, built in 1836, was the former residence of renowned families and opulent businessmen. Florida Hotel, fit to the American and European comfort, opened in 1885 and became one of most famous hotels in the capital city. With the splendor of the past, Florida hotel is reborn in the Old Havana, captivating the guests with all of its charm and architectural beauty. 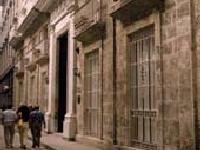 The building erects just a few meters away from the Arms' Square on a lively corner of Obispo Street. The surrounding shops, art galleries and attractive museums create the magic atmosphere of its setting. A distinguished ambiance and the personalized service invite you to discover the charm of the past from the present.